Print Page - Coloring Ball: „Advent Calendar“ - WINNER ANNOUNCED! Title: Coloring Ball: „Advent Calendar“ - WINNER ANNOUNCED! (http://fs5.directupload.net/images/user/170812/ditzmiri.gif) Let's go and have some fun! (http://s1.directupload.net/images/user/120328/l6khwsua.gif) ... and now a last reminder to all the others who didn't join so far - still some days left to come up with something!!! (http://fs5.directupload.net/images/user/170812/ditzmiri.gif) Let's start filling the Advent Calendar! We got socks, socks, socks ... and socks! You ... are ... great! It's-a me, HO HO HO!! What do kids want these days? Why, a blue cup and a brand new copy of AGS of course! VOTING!!! (http://s14.directupload.net/images/user/111215/c59xbl23.gif) VOTING!!! (http://s14.directupload.net/images/user/111215/c59xbl23.gif) VOTING!!! So please tell us which entries are your favorites. Everyone is allowed to vote for his/her favorite sock! Please vote for the number of the entry that you'd like first, second and third placed and if you want, tell us why you have chosen it. 1st No 03 by AnasAbdin - Really pleasing aesthetically. 2nd No 01 by Rocchinator - Appeals to the little boy in me. 3rd No 06 by Glenjamin - So many nasty things in one sock! 2nd No 10 by arj0n - Param Pam Param Pam Pam! 3rd No 12 by Cassiebsg - What every kid wants! 2nd: No.2 by AnasAbdin - For the artistic execution. 3rd: No.10 by arj0n - Mario! Title: Re: Coloring Ball: „Advent Calendar“ - WINNER ANNOUNCED! – like an award ceremony - to hand out my little badges. a well polished participation badge with an AGS-blue candle for all of you that created an entry but couldn't catch one of the above badges. Hope you all had a bit of fun and wish you a nice advent season! (http://fs5.directupload.net/images/user/170901/qli53bp6.gif) C U at the next CB! 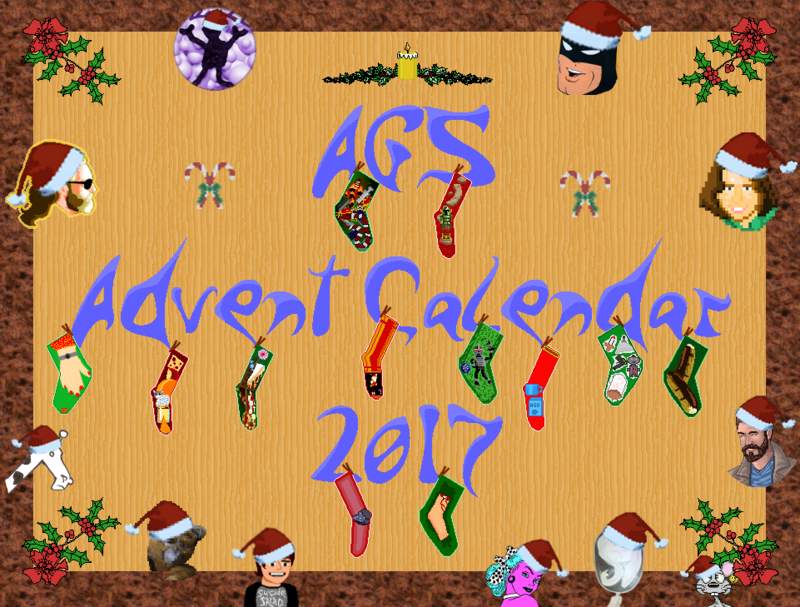 And that's an awesome AGS Advent Calendar 2017, Tabby! Yay! Thank you all for the votes! And congrats to everyone! We all got away with awesome trophies! Special thanks to Tabata! Always coming up with cool themes, shapes and trophies! Also, it looks as though we have a twelve day advent calendar. I guess on the twelfth day of Christmas my true love gave to me, a foot in a stocking. CONGRATS TO THE WINNERS! AWESOME ENTRIES, AND EXCELLENT CONTEST PIC AND HOST TABATA! Congrats, AnasAbdin, a well deserved win. Yes, please. I love your Santa hat. I love this! Thank you Tabata for making this.